Its monsoons and everyone of us would love to sit at home nearby the windows or at balcony and enjoy garam garam pakoras and enjoy watching the rains in a chilly wet evening. Pakoras are favourite among every indian, being young or old. And everyone loves to have them during monsoons. Punjabi style pakoras are known for their crispy and spicy taste. There are varieties of pakoras like Aloo pakoras, Gobi pakoras, Palak pakoras etc. One such pakoras is Paneer pakora, which is just tempting during chilled evenings. Paneer Pakoras is a well known snack from Punjab and I thought of posting this now since the period of monsoons are just perfect to share this recipe and enjoy them. Firstly cut the cheese into thick square pieces.Cut them in size of 3 inches wide and 2 inches broad and height of atleat 1 inch. Sprinkle mango powder and red chilli powder on these pieces. Mix the gram flour,rice or corn flour, red chilli powder,amchur powder, hing, ajwain, soda and salt in a bowl. Add some water to the mixture to make it thick batter.Dont add more water at a start. Add part by part in small quantity to avoid forming lumps , this helps in making smooth batter. Add water only to the consistency to make the batter smooth . Dont add too much of water and end up making its consistency too thin. Dip each piece of the cheese in this batter. Check whether the oil is hot enough. This can be checked by dropping few drops of the batter into the oil. If it is hot enough to fry the pakoras, then you can see those batter coming up and bubbles surrounding them indicating its ready for frying the pakoras. Now put the pieces of cheese in the heated oil one by one. 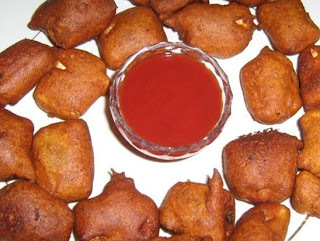 Remove them in a Oil absorbent paper or place a tissue paper at the top of the plate where the pakoras would taken out. Serve the Paneer Pakoras with green chutney or with tomato ketchup. Serving suggestion: Serve hot with green chutney or tomato ketchup. Normally, rice or corn flour is not added to the batter. But adding 2tablespoons of corn or rice flour would make the pakoras crispy and crunchy. Amchur powder is added to give a tangy taste . Sprinkle a pinch of chat masala over the paneer pakoras while serving. It makes them even more tastier.